West Sussex Art Society member Dudley Sawer will be showing some of his artwork in Worthing Library from Saturday 5th December to Saturday 19th December. The show, ’15 Artists’ also features work created by students attending Dudley’s life drawing courses and workshops and all the work will be for sale. 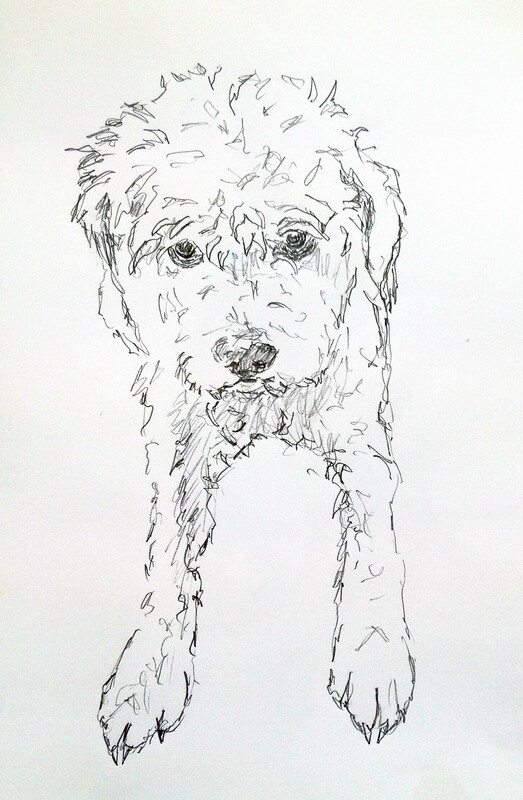 West Sussex Art Society chairman Andrew Griffiths is runner-up in the David Remfry ‘Draw your pet’ competition at Pallant House. Congratulations to Andrew. It’s a great achievement to have your work chosen by Royal Academician Mr Remfry and ‘2nd Best in Show’ is something to celebrate! Here is the drawing of Andrew’s adorable hound Badger. David Remfry RA, who personally judged the competition, has spent the last 10 years making drawings of his friends with their dogs, exploring the deep relationships that people have with their pets. The drawings are now gathered together in a book ‘We think the world of you: People and Dogs drawn together’ and some of those drawings are also featured in a small exhibition at Pallant House, Chichester – until 13th December. I’ve added a new page to the site. ‘Worthing Art Trail 2015’ under ‘Exhibitions’ features work by Society members who took part in the Art Trail this summer in Worthing. If you belong to West Sussex Art Society and have some images of your own work exhibited during the trail please let me know at the next Society meeting and I can add them to the page. We had some great work at Venue 44 and I’d like to add more images to the Art Trail page as I know many of you were involved. Let’s showcase the talents of all Society members on this ‘WSAS exhibitions’ website.